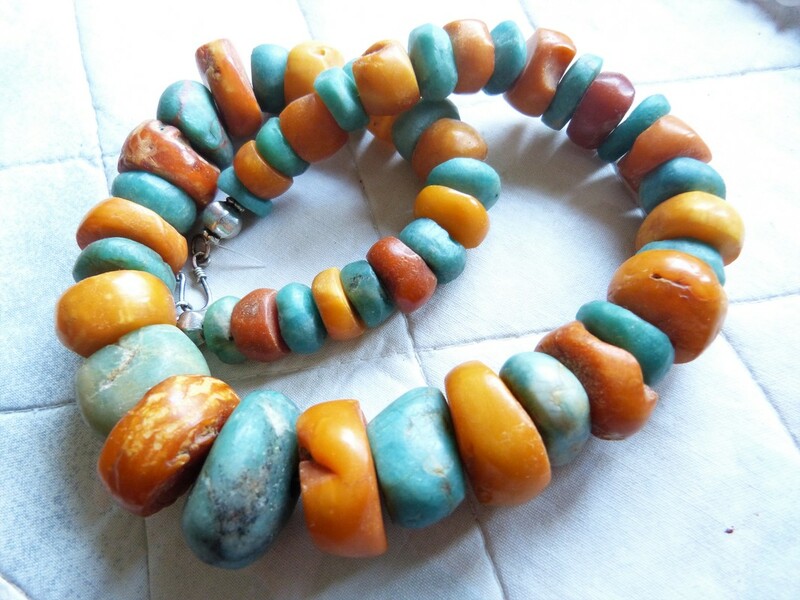 Antique Moroccan amber and ancient amazonite beads necklace, 178 gParagraph. Aussergwöhnliches Goldarmband 18 Kt 750 iger Gold. Absolutes Unikat, handgearbeitet 1995 nach eigenem Design. Die runden Teilen sind dem Rüsselende eines Elefanten und die Verbindungsglieder dem Fuß eines Elefanten nachempfunden. Die Innenseite aller Goldteile ist poliert, auf der Aussenseite sind einige Teile gebürstet. 750 hallmarked solid gold bracelet, 72.2 grams, handmade, unique, made to order on my own design in 1995, using patterns of muzzle and trunk of an elephant. 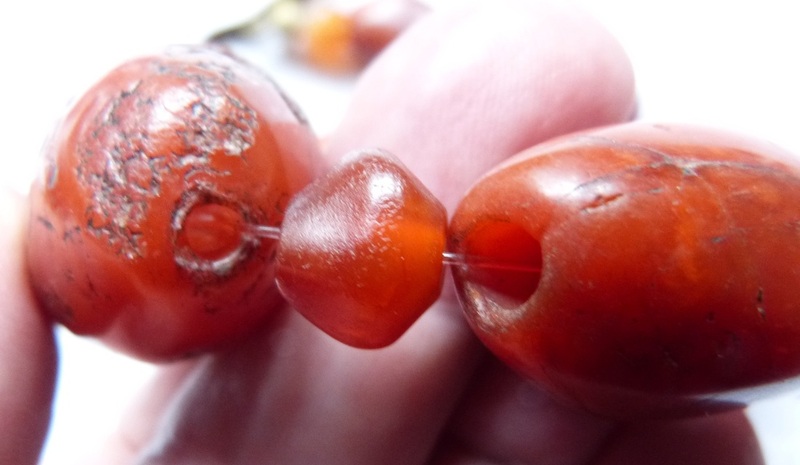 Ancient Carnelian disk bead necklace from excavations in Mali, with sterling silver beads arranged at random. Antique Venetian seven layer chevron beads necklace including ancient green chevron ! 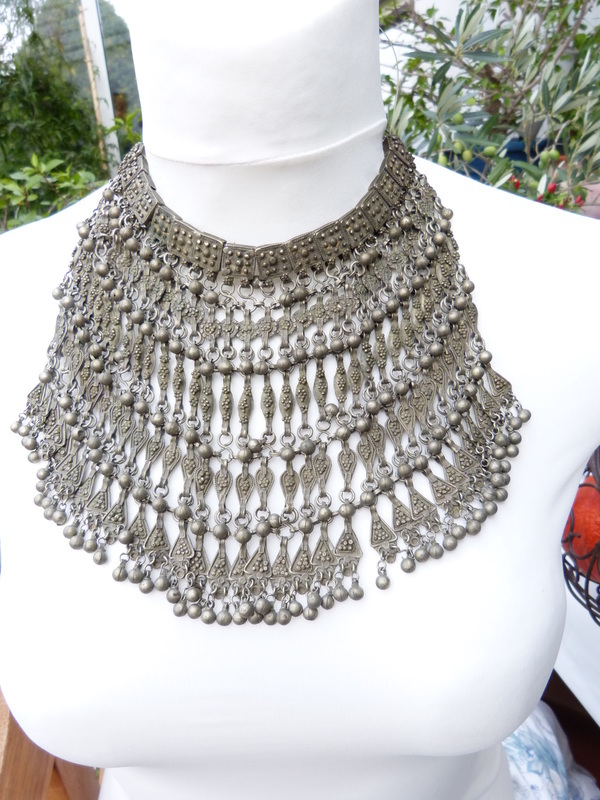 For sale is an antique authentic silver alloy or metal necklace from Yemen, A Labbeh or Kirdam. A mesh veil which was offered to the bride as wedding adornment and usually worn attached to the headgear veiling the face. It could also be worn as pectoral jewelry. The necklace for sale here has been adapted to be worn today. I have strung the meshed pieces on heavy beading wire and used sterling silver and antique untreated coral for the back part. I have not yet finished the necklace as it should be tightly worn around the neck and length depends entirely on the wearer. 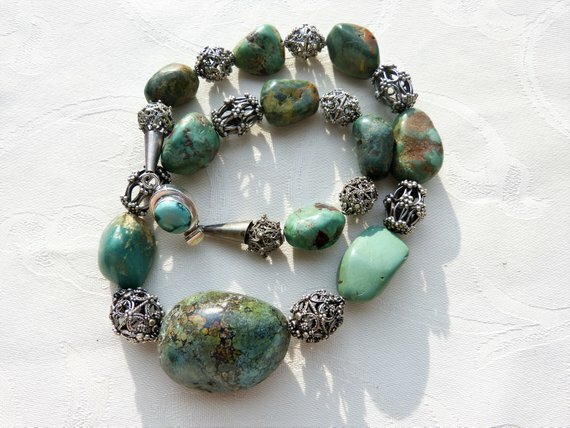 This necklace was/is part of my private collection of jewelry. 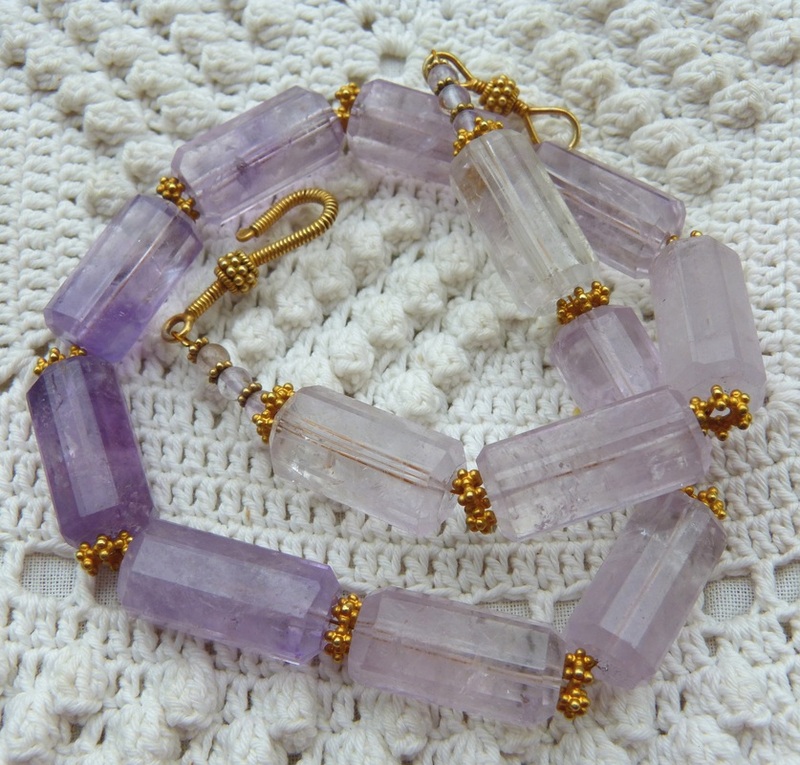 I am selling it as I do not wear amethyst anymore. length 47 cm, exclusive Bali vermeil clasp. Large round Idar oberstein agate. 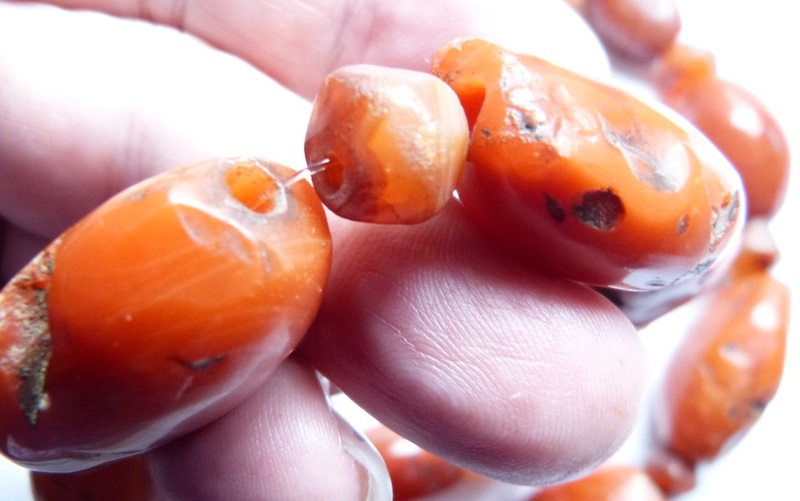 This is Brazilian agate exported to idar Oberstein betweeen 1890 and 1920, cut and polished there, and than exported to Africa for the African Trade. Highly sought after pieces! 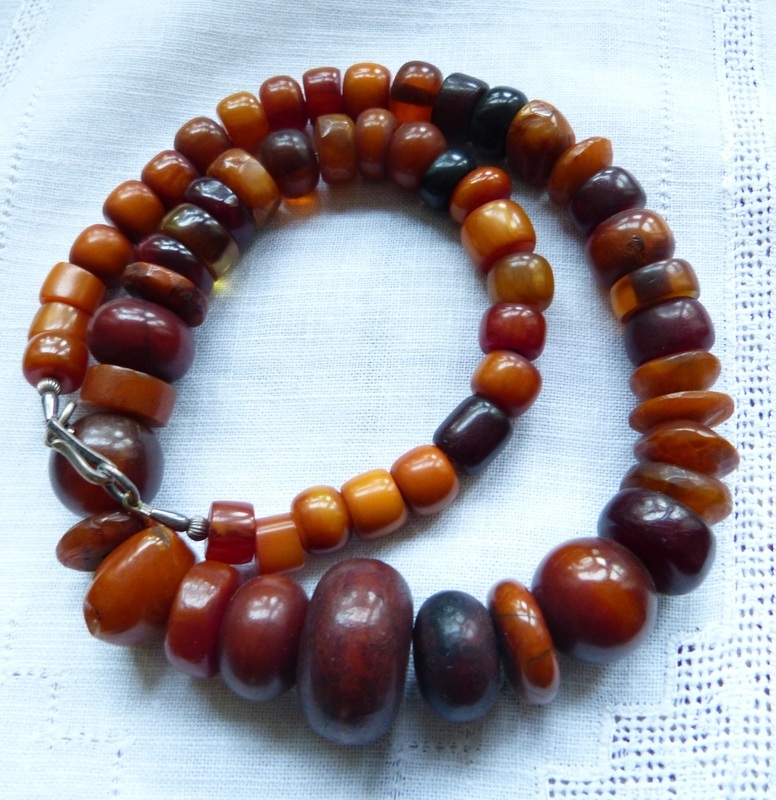 Faceted Idar Oberstein Brazilian agate beads (1920s) and African amber. Venetian chevron beas drom the early 1900s reground by Mastergrinder Rick Rice, US. Here strung with huge lapis balls, smaller lapislazuli and Senegal "or du pays"
Antique glass beads, opalescent Venetian and , Dutch made in the mid 1700s, which are also sometimes called "Moon Beads". The two large rund gold beads are 18 ct handmade in Senegal, the other beads are Senegalese "or du pays". This is an extraoridnary brooch pendant in silver - no hallmark!. 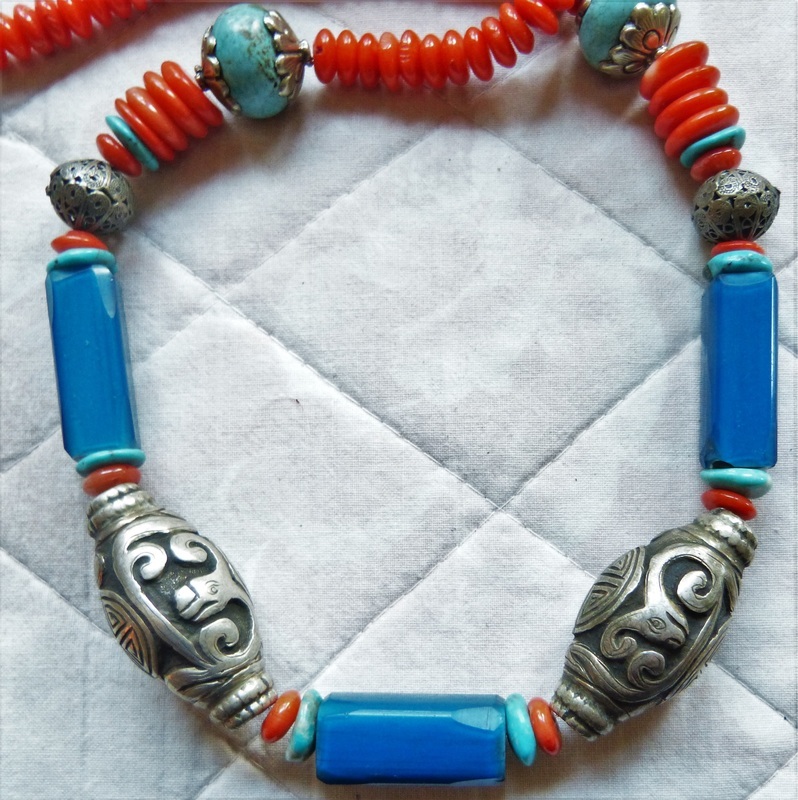 The large carved stone is set in silver and the silver decorated with lovely untreated coral beads. The closure of the brooch pin is dysfunctional and the pin itself should be removed if used as pendant. The bale has obviously been added later, the third coral bead on top left has been replaced! 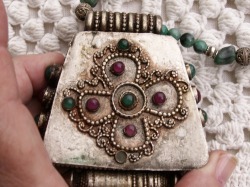 In overall top condition as pendant. If using the brooch the closure should be repaired. 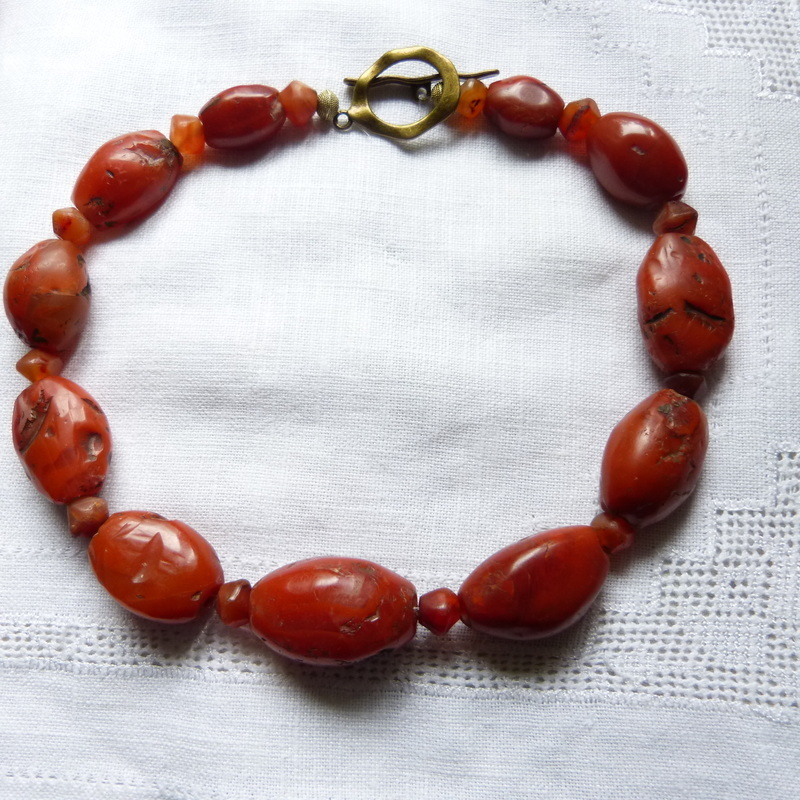 I am selling it with an antique victorian coral necklace of untreated coral. 18 grams, diameter of beads 3 mm, length of strand 137 cm. If you want to keep pendant and strand separate, the necklace slips through the bale and could be closed in the back with a ring. i can also string pendant and necklace for you and add a sterling silver hook clasp. 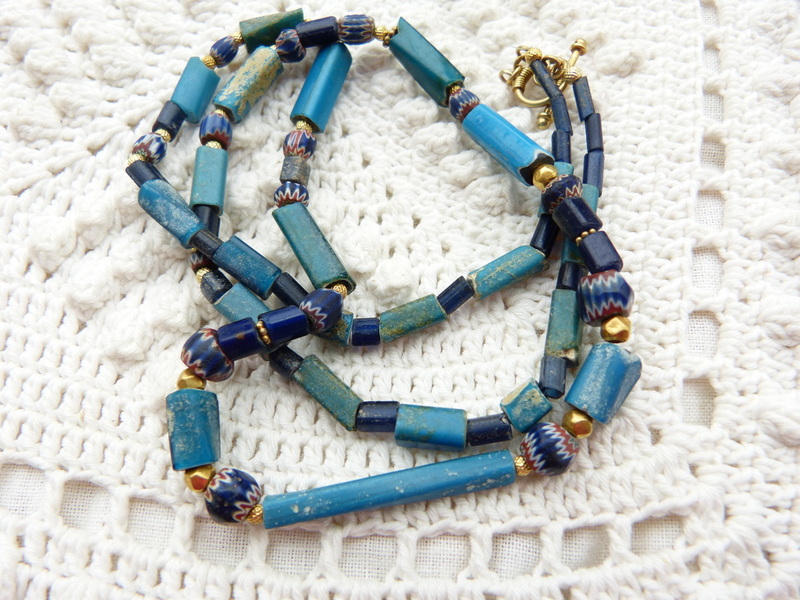 A sensational necklace created with a few antique long and trapezoid banded Suleiman agate beads . 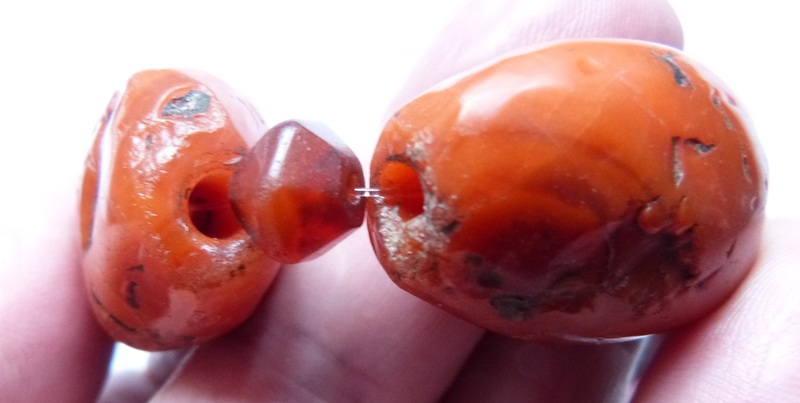 I do not know how old the banded agate beads are but they definitely show signs of extensive wear. 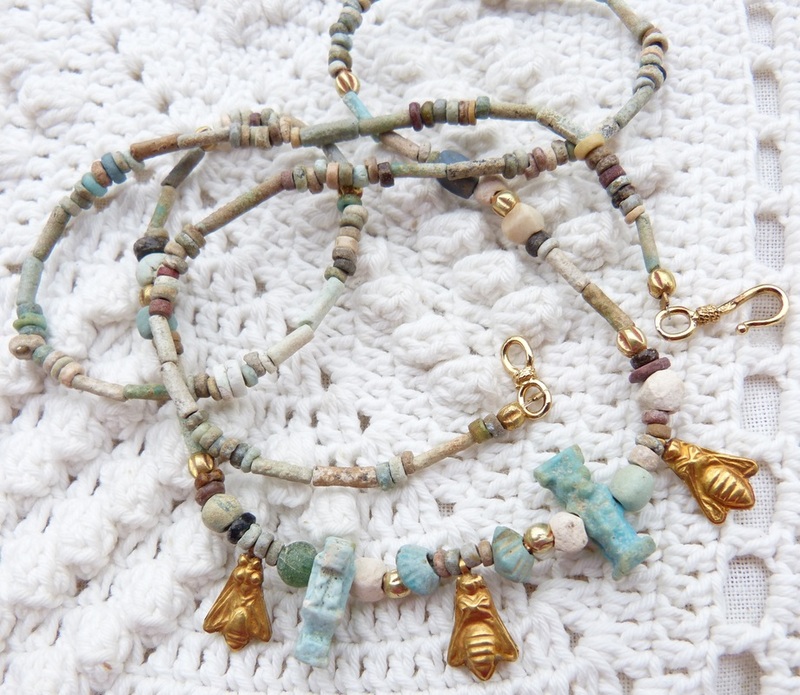 I have strung the long beads and the two trapezoid beads with old corrugated gilded brass beads, brass spacers and the large round bead has brass caps. This round bead is polished buffalo horn from Nepal and matches very well with the cream colored bands in one of trapezoid gate beads,. Dark Brown faceted beads are new agate beads. A unique elegant and eye catching necklace! Extraordinary necklace created around an old buffalo horn comb/headdress from the Moluccas Islands in East Indonesia. The comb is intricately carved from a piece of buffalo horn and served as headdress I have not damaged the comb in any way but attached it to the necklace by means of tiny strings of coral beads from a broken Victorian necklace. The picture of the back of the comb shows the small pewter plates which hold the coral. The necklace is kept very simple : sterling silver, more antique coral and black vulcanite heishi disks. In its simplicity the necklace enhances the beauty of the old comb. 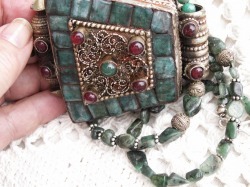 Gorgeous antique ethnic adornment wearable today! bought a few years ago from a reputed dealer in Barcelona! 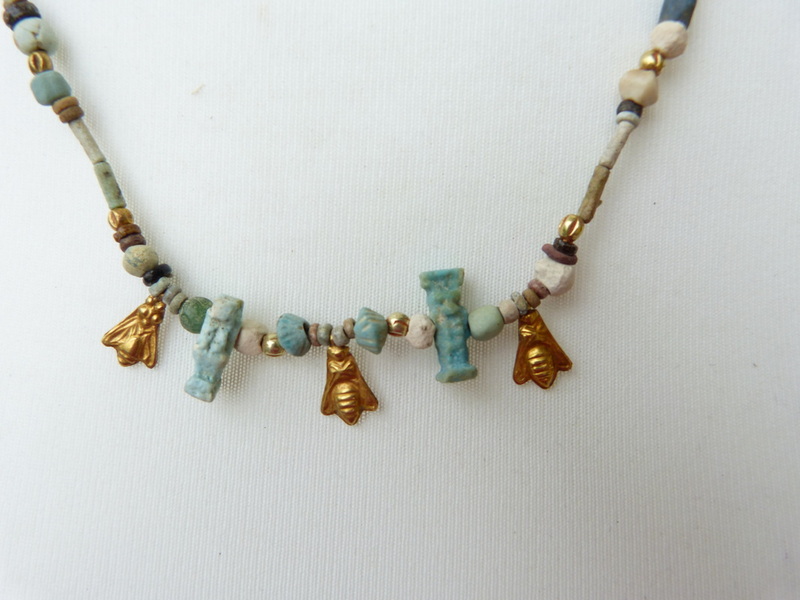 Exclusive necklace with ancient glass beads. which are almost 1000 years old. Three Islamic ese beads from the late Roman to early Islamic glass bead making period (900 to 1100 AD, see bead time line ) are strung with glass beads from excavations in Djenné, Mali, dating from the same period. the eye beads are two blue beads with white and dark blue eyes, the focal bead is green glass with red-yellow eyes. All three beads are in pristine condition. Focal bead 12 mm diameter, tiny beads 2 to 3 mm, length of necklace 50 cm, sterling silver spacers and clasp. A necklace with very very rare beads! I am happy to provide more photos! This is my second EKIPA, made into necklace. It is in its orignal state with pierced back to be attached to belt or clothings. 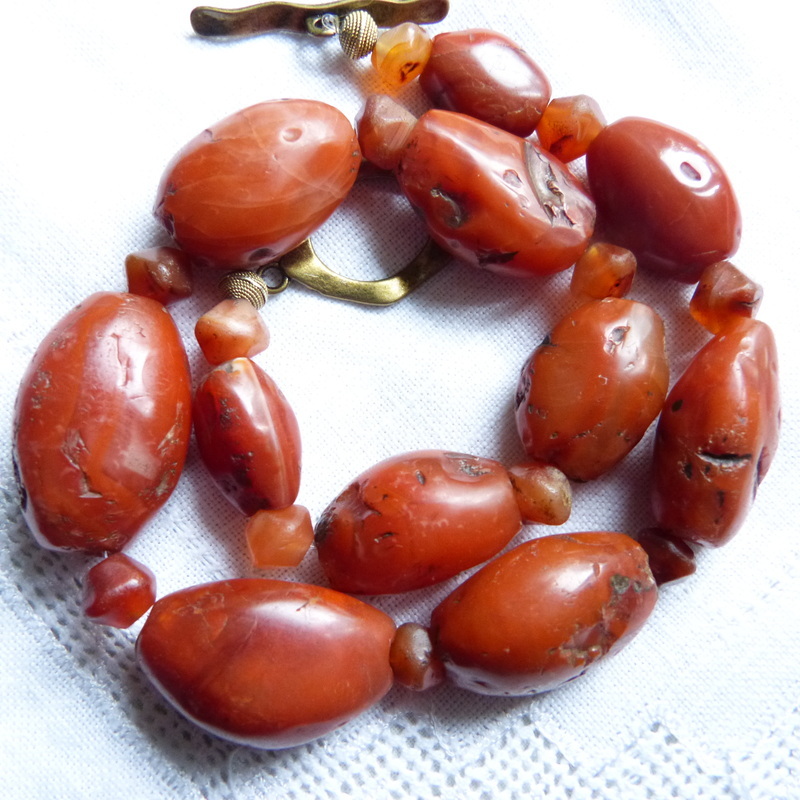 This necklace has been crated around a beautiful Namibia Bushmen Ekipa, ox bone button! This button is NOT antique , however very very well made. Bushmen wear these buttons on their clothing. I have put a sterling silver wire through the holes in the back for stringing the necklace. 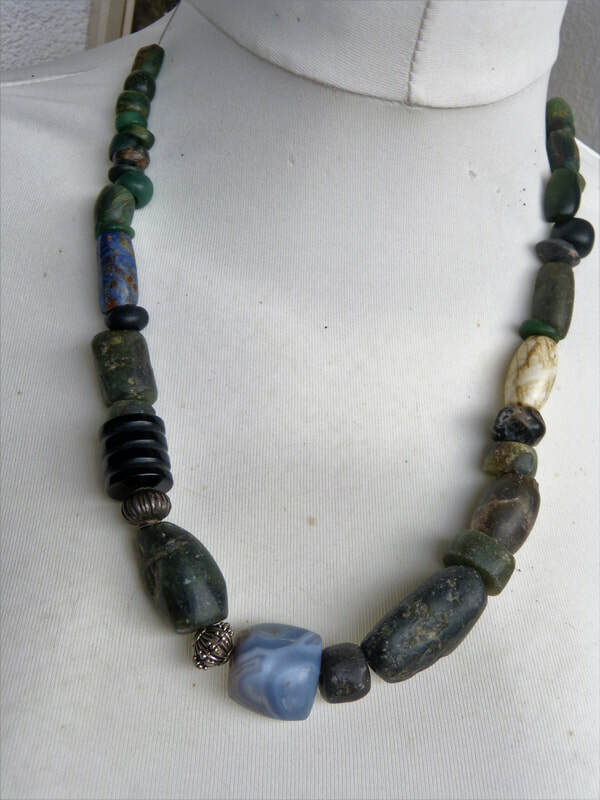 The necklace is kept very simple with shell beads (same color as the button), large bakelite heishi from the African Trade, haematite beads and a sterling clasp. 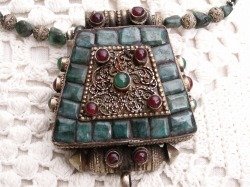 Antique Tibetan silver Ghau with intricate detailed work. Front part emerald cut emeralds, filigree work emerald and ruby cabochons, sides and back ruby and emerald cabochon; inside turquoise inlay and silver colored Tsa (seems recently added - too shiney compared with the Ghau). An antique Fulani/Pheul hair ornament is made into a necklace/choker with garnet beads. The ornament is cone shaped, measures from tip to bottom 45 mm and has a diameter of 55 mm. It has two tubes on the backside where it used to be sewn onto the braids. Aan 18 Kt gold wire is stuck into the two tubes and the four strand garnet part is fixed onto it. The garnets are new and come from India, they have a red Bordeaux wine color and are almost flawless. Marked gold plated sterling silver clasp. The ornament is a silver-gold alloy, NOT goldwashed. This kind of jewellery was made in the late 1800s/early 1900s and can be up to 10 Kt gold. The pendant/focal bead is a very rare collector's item! 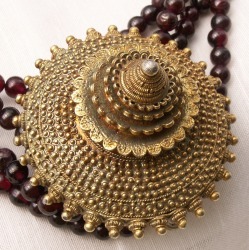 And this piece is an exquisite item of Tribal meets classic jewellery! Length of choker 38 cm - it should sit very tight around the neck!